Seatbelt ID can Save Your Life! Traffic accidents are often very chaotic and dangerous. Precious time can be lost searching for your medical information. After a crash, airbags can become very unstable and deploy without notice. This creates a known hazard for first responders and glove boxes are often avoided. Additionally, often times, contents of vehicles are lost in debris both inside and outside the vehicle. The seat belt is the only portion of the vehicle specifically designed to withstand such a traumatic event. What better place than the seat belt to ensure that your information is secure and available to emergency personnel? When Emergency Service Providers arrive on the scene of a medical emergency to render aid, one of the first steps taken involves removing the patient's seat belt. The Rescue Facts Emergency Information Pack wraps around your seatbelt, your spouse, and even your infant. It provides an instant method of communicating crucial information to EMS. 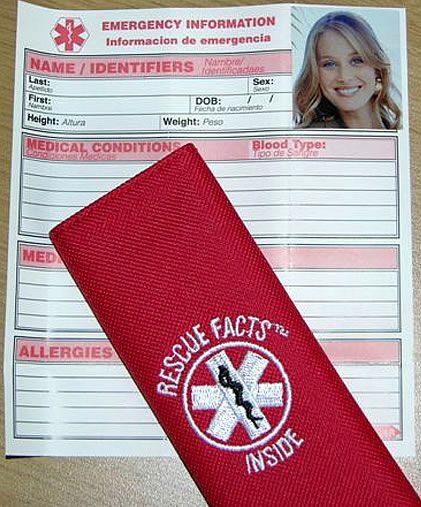 The Rescue Facts information wrap is specifically designed to capture the attention of emergency personnel while protecting your privacy. How does Rescue Facts Work? There are two parts to the Rescue Facts product. The first is the nylon, embroidered material. This is made from durable nylon, similar to outdoor flag and banner material. The medical symbol is either embroidered or silk screened onto the wrap. The wrap fits around a seatbelt, helmet strap, backpack or infant carrier and is secured by Velcro. This allows it to slide freely and avoid damaging the seat belt material or clothing item. Inside the strap is a pocket designed to hold the paper medical information insert card. The medical information card is perforated and scored for your convenience. Once the insert has been filled out and placed in interior pocket of the strap, you are free to attach it anywhere you have a need. Can I use Rescue Facts on Items Other than Seat Belts? Absolutely! The Rescue Facts strap can be applied to many items. Many times elderly people suffering from dementia or Alzheimer's walk away from care providers and can't remember where they live. Attaching a strap to a trouser belt, purse, or suspenders is a great way to conspicuously communicate personal information. Other popular uses for the strap include canes and walkers. For this use, the child seat size works best. This size strap fits securely around most walkers and canes and can easily be placed in a manner that catches the attention of those lending a helping hand. Hikers also find good use for Rescue Facts by attaching them to their backpack straps. The sky is the limit with this versatile product. The right choice when medical attention is necessary!